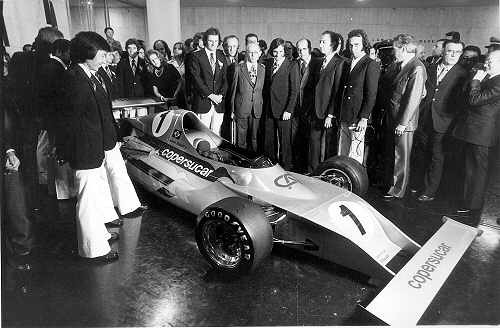 This is the initial ‘press launch’ version of the first car produced by the new Brazilian Copersucar team. While Spark identify the car as 1975, my references indicate it was actually presented in October 1974. 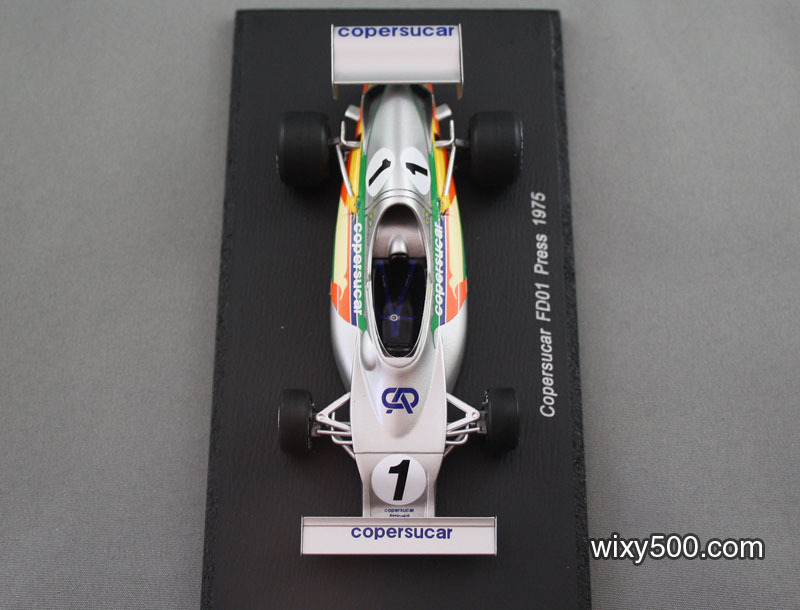 Designed by Richard Divila, constructed in Brazil and sponsored by a Brazilian sugar company (Copersucar), it was a very unusual shape for an F1 car and looked very futuristic for the time. It had wind-tunnel inspired lines that featured all-enveloping rear bodywork that housed radiators well behind the rear axle. 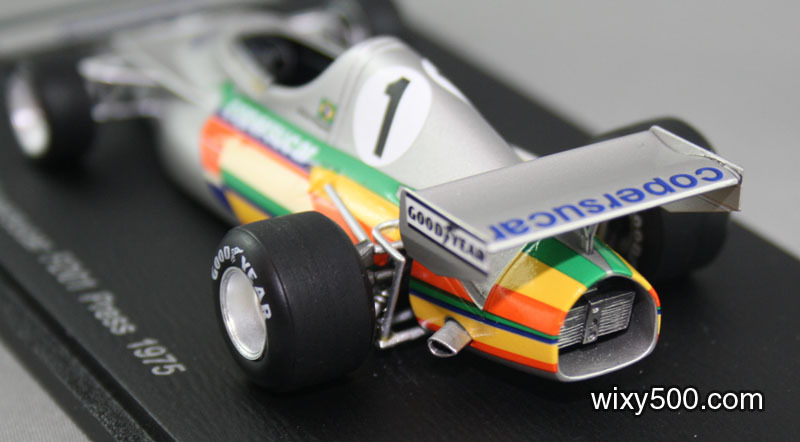 It also had side-exit exhausts and full width front wing over a dished wedge nose. It’s got a Big Arse! 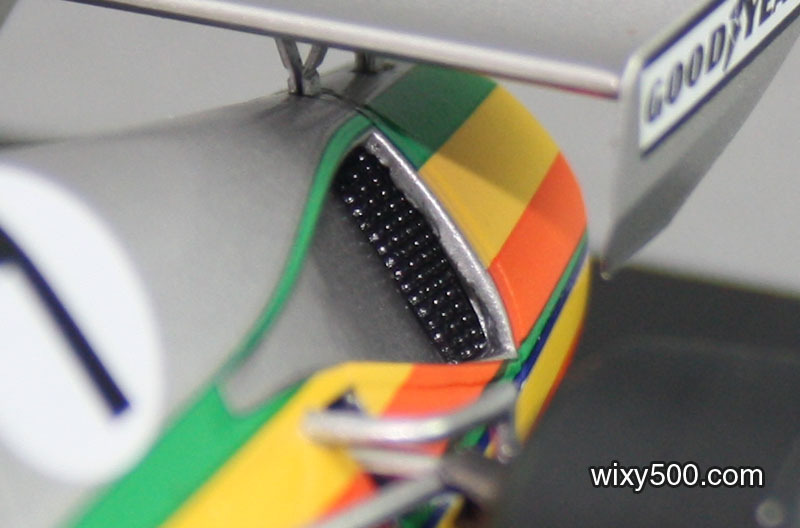 Angled tear-drop tubes are the exhaust outlets for the DFV V8. 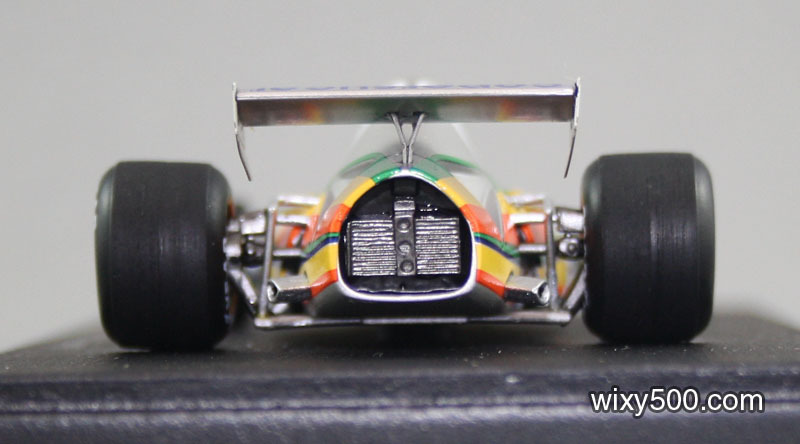 Strange ‘reverse shape’ rear wing profile is correct. 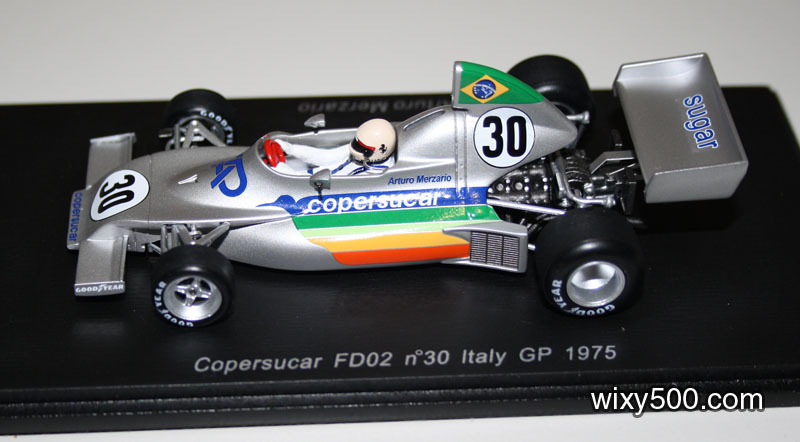 Wilson Fittipaldi (Emmo’s elder brother) drove the car but it never raced in this exact ‘presentation’ configuration. 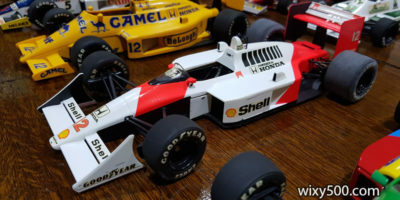 The car was uncompetitive, so much so that when the second and third chassis were produced, most of the superfluous bodywork had been discarded and the radiators re-positioned ahead of the rear wheels. 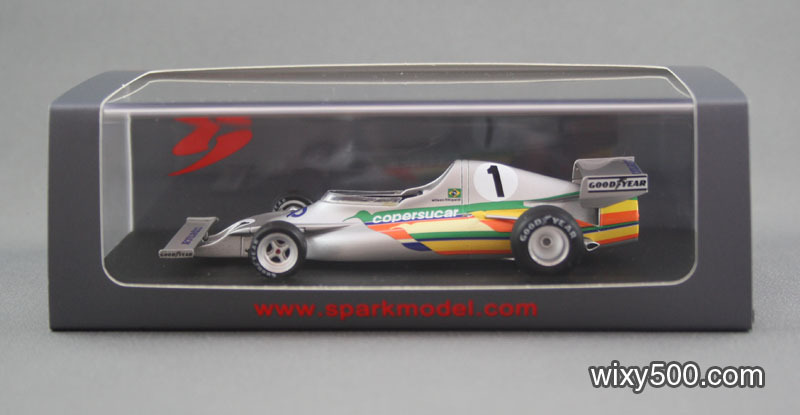 This is Spark’s version of Copersucar FD02 (Arturo Merzario, Italian GP 1975) . 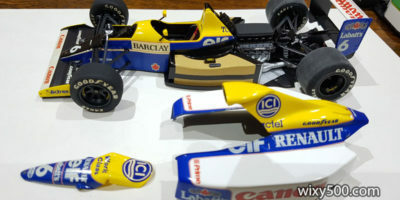 Basic chassis structure of the FD01 is still there, but the bulky rear bodywork has gone, conventional engine cover and intake has been fitted, radiators moved ahead of the rear wheels plus more conventional front and rear wings. The FD01 (F for Fittipaldi, D for Divina) was the first of several cars the team constructed. Most of their cars did manage to score a world championship point or two, but there were no race wins. Renamed as Fittipaldi in 1980, the team stumbled through several Grand Prix seasons before exiting F1 at the end of 1982. 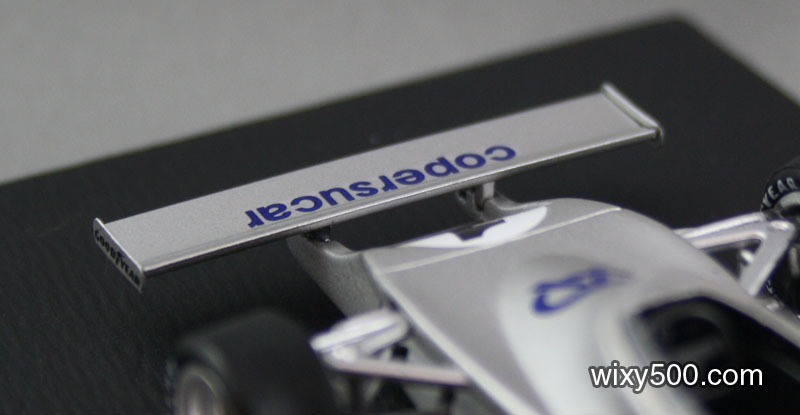 This item from Spark has a good paint finish, but the components that are plated or polished alloy (ie, rims and suspension arms) are the usual Spark dullish silver. Body shape and markings generally reflect the press photos of the time. Close inspection reveals mould lines on some of the suspension arms, plus some very minor decal misalignment around the big ducts at the rear. There is no engine detail because it’s all covered by bodywork. Radiator in the rear cowling. On the race version, the radiator took up the entire space! Wing end-plates and mounting are nice and thin. Front view. Suspension arms look a little over scale. Full width forward mounted wing. 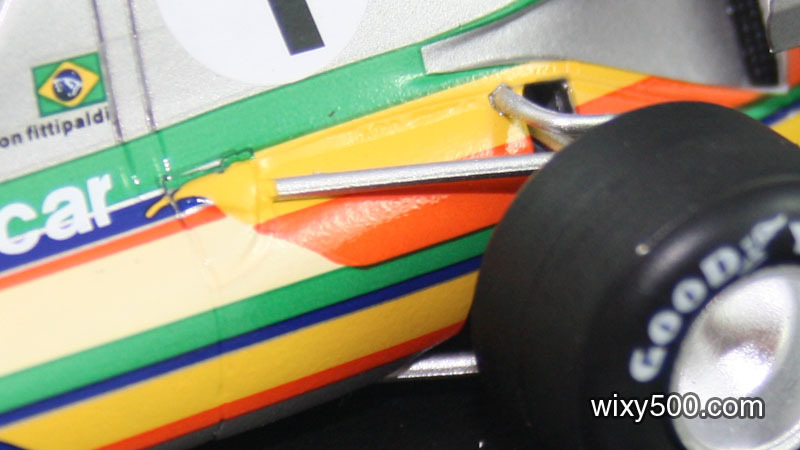 The two front wing mounting pylons are not as slim as in the press photo. Air inlet features a mesh finish. There’s a small alignment issue with the main decal. No driver figure in this one. 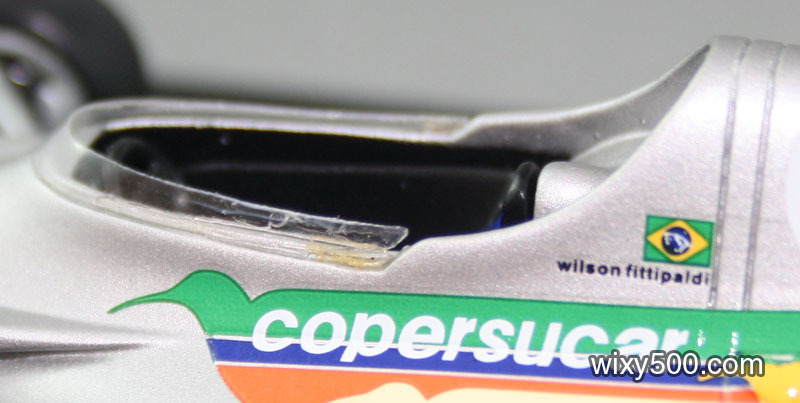 Belt detail is all decal. Cramped cockpit meant a flat-bottom steering wheel was required. Spark has included fine dash detail, like the tacho. QC/assembly problem with the windscreen. 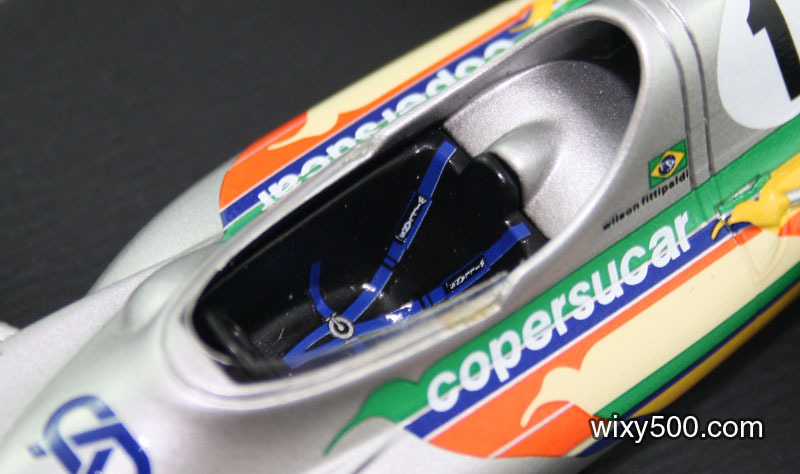 An interesting cutaway of the FD01 shows some of the internal workings. This illustration is of the modified ‘race’ version which required extra cooling – note the small radiators in front of the rear wheels. Spark has done a model of this version too.